For a change we woke at the decadently late time of 7.15pm! The communist workers of Vietnam already out grafting in the fields would be shocked to learn of such western bourgeoise practises. In spite of our late awakening we were still one of the very first into breakfast. First task of the day was to pack in readiness for our afternoon flight to Siem Reap. With that completed we set off down to the beach and headed off in the opposite direction to our trek a few days previous. Half an hour of splashing our toes in the surf brought us to some little bread basket fishing boats. They are similar to the Irish Coracles but I guess a little larger and more stable as these are built for the sea., not a lake. 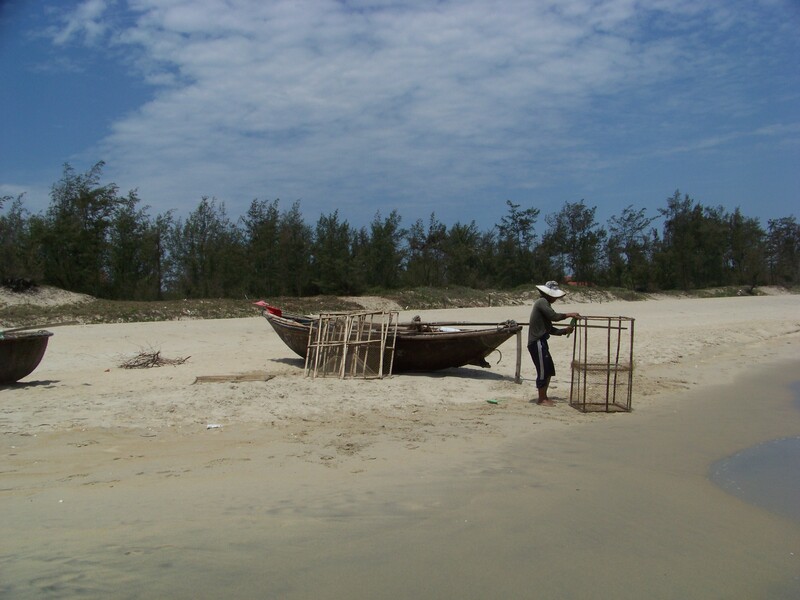 For a while, we watched a lone fisherman repair a netted structure that obviously somehow caught some type of creature living below the waves. It looked like the last one it housed, had a bit of a temper! Retracing our steps we braved the now hot sand and diverted to a little beachside bar and played my favourite game, watching the locals and tourists pass by with refreshments at hand. At 35p for a large cold bottle of beer we dallied and then consumed a second. I should mention that Sue ordered fresh lemon juice that displayed its authenticity with a large number of pips that shot up her straw. Suitable cooled and revived we returned to our room, paid our bill and checked out. Reception looked after our suitcases, while we stepped across the road and had lunch. The lady owner once again sat with us we chatted until it was time to return in readiness for our transfer to Da Nang Airport. The taxi arrived 15 minutes early and we duly set off. Check-in took less than 5 minutes, and though we had a short wait for the International Departures gate to open we were soon through into the departure lounge and sitting talking to Ron and Jenny who we had spotted earlier on. Our flight left on time, we were on a half filled small turbo-prop aircraft. It reminded us of the last time we were on one of these in Nairobi, then, we sat quietly while the engines revved up, then powered down and two hours later we caught a jet to Zanzibar. Not so this time, it flew. The flight time was one hour and fifteen minutes and significant from the point of view that on the approach to the airport you could clearly see the patterns of bomb craters left by the Americans, now filled with water. Some craters were huge and they appeared to be everywhere. Do I remember from my youth that the American line was: We are not bombing Cambodia, our troops are not fighting there. Yes Mr Nixon, you lied! Despite having an Evisa stapled into our passports at $80, we still had to fill in three immigration forms on the plane and have our hand and thumb prints scanned at passport control. However, our suitcases were first off the belt and first away from the airport as our driver wa there to greet us as we left Arrivals. The 15 minute ride to the Angkor Paradise Hotel went with less hooting and swerving than in Vietnam, perhaps the Cambodians are more law-abiding citizens when it comes to driving. Let’s hope. 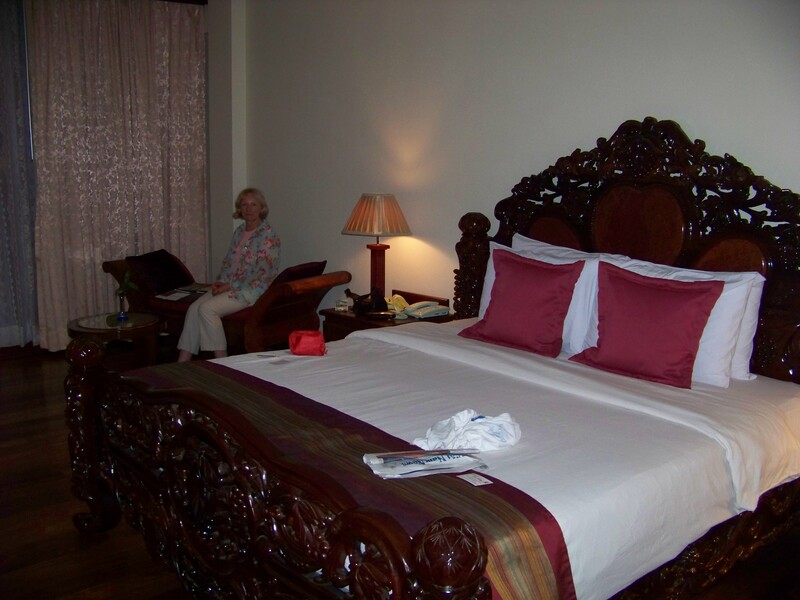 Check in was quick and we found ourselves on the top floor in a large room decorated in traditional Cambodian style with a large balcony overlooking the pool and gardens. After putting our documents etc. in the safe, we returned to the Reception and Concierge Desk to discuss how we could get to see the Temples. We had already discovered that it is warmer here than in Vietnam so we booked ourselves a car and a guide for the day, from 8am tomorrow. Another early start! Most people do the Temples by Tuctuc but I think we are at an age where the refuge of a car aircon is quite necessary. Having sorted tomorrow out, we decided to interrogate our guide as to what was good to do on the following day. We took our evening meal in the hotel and it was very good. They do a beer here called (not surprisingly) Angkor and it is good. It has taste, unlike the Vietnamese rubbish I have been subjected to. Afterwards, we had a little stroll up and down the street outside to get our bearings and see what was there. It is obvious that Cambodia is poor and that Europeans don’t usually venture out of the hotels on foot. Back at the hotel we were in bed for 10.30pm. This entry was posted on May 16, 2015 at 4:18 pm and is filed under Uncategorized. You can follow any responses to this entry through the RSS 2.0 feed. You can leave a response, or trackback from your own site.